In most homes, the kitchen is the center of activity. However, poorly designed, outdated and tired kitchens can make an entire home feel worn out and old. 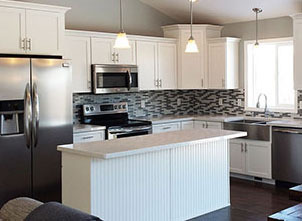 Mankato Family Homes can help you bring your kitchen back to life and restore the energy to your home! Imagine how it will feel standing in your newly renovated kitchen. Plus, kitchen remodels have the greatest return on investment when selling your home, closely followed by bathroom remodeling. It is crucial that you choose the best-qualified contractor to do your kitchen remodel, as well as a remodeling company that has creativity and experience in remodeling a kitchen. There are many things to consider when remodeling a kitchen including layout, design, cabinets, appliances, countertops, hardware, backsplashes, flooring, and more. Mankato Family Homes’ design experience, remodeling knowledge and expertise will help you design the perfect kitchen that will fit your needs. Mankato Family Homes will guide you through your kitchen remodel from kitchen layout design to implementing all of your personal design ideas. The end result will be your dream kitchen. A kitchen remodel from Mankato Family Homes can make you fall in love with your kitchen.